Donald McEachin was serving as a Virginia State Senator when we decided to run for the United States House of Representatives representing the 4th District of Virginia. His campaign was successful and he began his term in Congress in January 2017. I designed and developed this site. While the logo design was not done by me, it did inspire site elements. 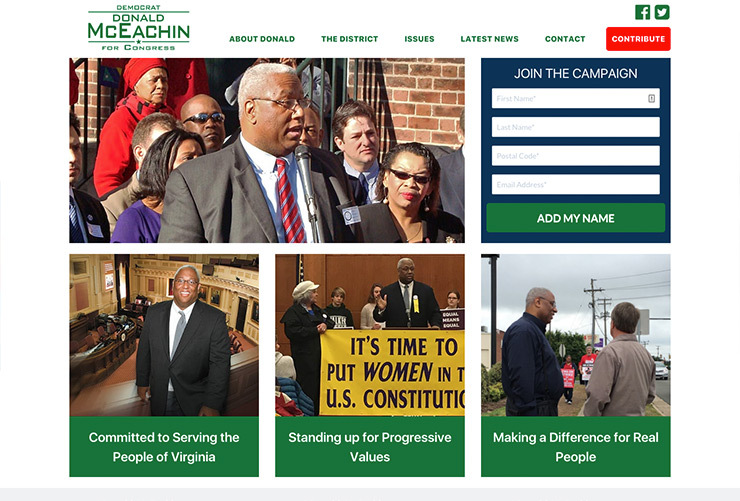 We definitely wanted to show Donald McEachin in action as someone who has been working for people for many years, so we were liberal in using photos of McEachin doing just that. McEachin maintains a social media presence, so we were sure to incorporate that into the footer of the site. The forms for supporters to sign up for campaign updates and contribute to the campaign are powered by NGP VAN and embedded using ActionTag. Once embedded, I was able to style the forms to more closely match the design of the site for a more streamlined experience and consistent appearance.